Description: X-ray photoelectron spectroscopy is a surface sensitive method for obtaining both composition (atomic percentage) and chemical bonding (oxidation state) information. For PGM-free catalysts, the doping of carbon supports with metals and nitrogen is critical to performance. How atoms are doped into the carbon support depends on the choice of carbon precursor and on the process used to prepare the support (temperature, process gas, etc.). 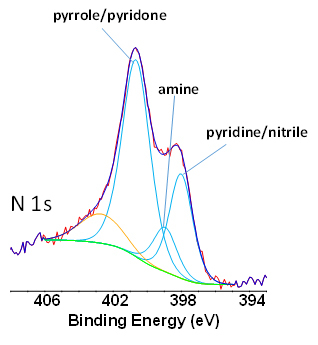 XPS has been effectively used to determine the chemical characteristics of PGM-free catalysts (see Fig. 1). 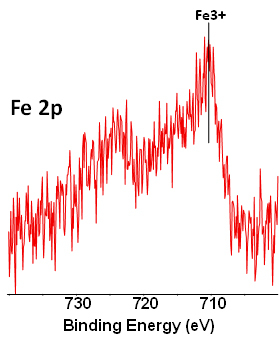 The primary strengths of XPS are: (1) ease of sample preparation (for most catalyst samples, the material to be studied is dispersed onto double-sided tape; (2) rapid measurement of overall surface composition using wide energy range survey scans; (3) detailed chemical bonding determination for elements of interest by acquiring high energy resolution core level scans; and (4) complementarity to other widely used characterization techniques like TEM, STEM, EELS, and others. Unique Aspects: For XPS analysis at ORNL we have available a Thermo Scientific K-Alpha X-ray Photoelectron Spectrometer. The instrument is equipped to handle a variety of sample types (most solid materials are easily analyzed) and a range of samples sizes and configurations (sub-millimeter to several centimeters). The instrument is equipped with a charge-compensator for analyzing insulating materials and an in situ Ar-ion sputter gun for depth profiling or sample cleaning. For air-sensitive materials, a vacuum transfer device is available. This device can accept samples up to 2 cm x 2 cm in area and up to 1 cm thick. The precision sample stage of the K-Alpha instrument can be used for chemical mapping, provided feature sizes are greater than 20 microns. Availability: Instruments in ORNL’s Materials Characterization Center (MCC) are available for partnership with industry through Strategic Partnership Projects (SPP), cooperative research and development agreements (CRADAs) via full-cost recovery (hourly fee), and direct project collaborations to facilitate new materials discovery and understanding; instruments in ORNL’s Center for Nanophase Materials Sciences (CNMS – a U.S. DOE Office of Science User Facility) are accessible through a peer-reviewed proposal process (no cost if results are publishable and full-cost recovery if data is proprietary). All instruments in the MCC and CNMS are available for characterization of PGM-free catalysts and MEAs. Benefit: ORNL’s XPS capabilities provide a cost effective way to chemically analyze important aspects of non-PGM catalyst materials that complement our other characterization tools.